Today’s feature is arguably the capstone of parental paranoia over the role-playing game Dungeons & Dragons: 1982’s Mazes and Monsters. 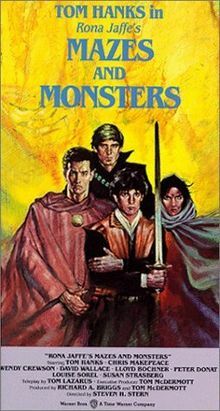 Mazes and Monsters was adapted from a 1981 novel written by Rona Jaffe (who served as a producer on the film), which was loosely inspired by the disappearance of James Dallas Egbert III, which was incorrectly cited as being related to his hobby of playing fantasy role-playing games. The screenplay for the movie was written by Tom Lazarus, who also wrote the movie Stigmata and worked on television shows like Freddy’s Nightmares and Jake And The Fatman. The director for Mazes And Monsters was Steven H. Stern, who specialized in television movies throughout his career. His other credits included Morning Glory, Rolling Vengeance, and Running, among many others. The cinematographer for the movie was Laszlo George, who shot movies like Nothing Personal, Running, The Bear, and Rolling Vengeance. The editor for Mazes and Monsters was Bill Parker, who cut numerous episodes of television series like Columbo, MacGyver, The Six Million Dollar Man, and Emergency!. The musical score for Mazes And Monsters was composed by Hagood Harding, who also did music for The Creeper, Anne of Green Gables, and the animated feature The Wonderful Wizard of Oz. The makeup effects for the film were done by one Linda Gill, who also provided effects work on movies like Johnny Mnemonic, Parents, PCU, Strange Brew, Alive, and Cocktail. 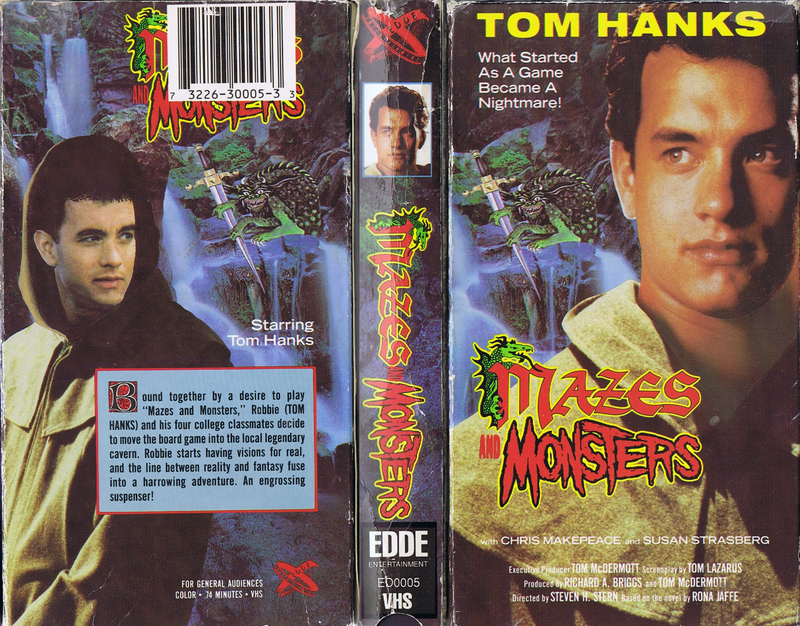 The cast of Mazes and Monsters includes Tom Hanks (The ‘Burbs, Catch Me If You Can, Splash, Road To Perdition, Toy Story, Turner & Hooch, Big, Saving Private Ryan, The Green Mile, Dragnet, Philadelphia) in his first leading role, Wendy Crewson (The Good Son, The Santa Clause, Air Force One), David Wallace (General Hospital, Days Of Our Lives), Chris Makepeace (Vamp), Lloyd Wolfe Bochner (Millennium, The Lonely Lady), Anne Francis (Forbidden Planet), Murray Hamilton (Jaws, The Graduate), Susan Strasberg (The Delta Force), Louise Sorel (Days Of Our Lives), Vera Miles (The Searchers, The Wrong Man, Psycho), and Peter Donat (War of the Roses, The Game). Bound together by a desire to play “Mazes and Monsters,” Robbie and his four college classmates decide to move the board game into the local legendary cavern. Robbie starts having visions for real, and the line between reality and fantasy fuse into a harrowing adventure. One of the co-stars of Mazes and Monsters, Wendy Crewson, starred in another similarly-themed movie in 1983: Skullduggery. This movie follows a young man as he slowly becomes a serial killer due to the influence of a role-playing game, and it is astoundingly far worse than Mazes and Monsters. Aside from Mazes and Monsters, the most famous thing to come out of the era of moral panic surrounding Dungeons & Dragons was a specific religious tract by Jack Chick, titled Dark Dungeons, which infamously portrays a highly fictionalized version of the game. 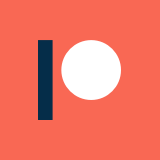 This story was itself adapted into a tongue-in-cheek web series in 2014, thanks to crowdfunded Kickstarter. The reception for Mazes and Monsters was generally negative, though it has become a bit of an ironic cult movie for fans of role-playing games. It currently holds a 4.2 user rating on IMDb, along with a 20% audience aggregate score on Rotten Tomatoes. Tom Hanks is one of the few bright spots in Mazes and Monsters. While his performance is certainly hammy, his character shows flashes of genuine emotional distress and earnest anguish, which is interesting to see in the early career of such a storied actor. Unfortunately, the rest of the cast in thoroughly unremarkable. The only character who really stuck out to me was the runt of the group, who only did so due to his fascination for wearing ludicrous and varied hats, which changed from scene to scene. Like with any movie with a definite message behind it, Mazes And Monsters is really transparent about what it has to say: that role-playing games and fantasy escapism are bad, period. This iron-clad belief doesn’t allow the screenplay much wiggle room to build the characters or portray the game in a way that is grounded in reality, which is always a weakness of this kind of movie. Also interesting is the fact that Hanks’s character is revealed to have already had issues relating to the game before the movie starts, and none of the other characters are harmed by the game. This sort of undermines the message, as clearly this problem had far more to do with Hanks’s personality and underlying issues than it had to do with the game. Overall, this is a legendary bad movie, both for it’s role in the moral panic surrounding Dungeons and Dragons and for its placement in the storied career of Tom Hanks. That said, it is a pretty dull film on the whole. There are a few stand-out moments that are certainly entertaining, but if not for its fascinating cultural relevance as a relic of its time, I wouldn’t strongly recommend that people go back and watch it. As it stands, though, this is worth digging up for bad movie fans at the very least. For more thoughts on the far-out movie that is Mazes and Monsters, I recommend checking out the episodes on the flick over at The Spoony Experiment and Good Bad Flicks.